She has always been his heart. He has always been her dream. Helena Leeson always knew where she wanted to spend her life: by Elias Repington’s side, the childhood friend who has now grown into so much more in her heart. Her father’s actions, however, plunge her family into a scandal with dire consequences for all. Will anything be left once this ordeal is over or are her dreams lost to her forever? Elias Repington, the Viscount of Chatleton, returns from Cambridge to find his childhood friend turned into a woman that steals his breath away. Now, he must undertake the most crucial mission of his life: solve the mystery that destroys her family, before it’s too late. Will he succeed in thwarting this disaster before it robs him of everything he ever wished for? Buy “Capturing the Viscount's Heart” and unlock the exciting story of Helena today! Loved, loved, loved this book. It is filled with shocking distress, false accusations, realistic feelings and emotions. The story starts innocently and looks into the life of two lifelong friends, Helena and Elias. After four years away from home Elias returns to a full-grown Helena. He is enchanted and begins to realize his feelings for her surpass his friendship. From the time she was fourteen Helena had been in love with Elias but did not fully understand those feelings till she grew into a young woman. Then tragedy strikes Helena's family and their fall from grace was unimaginable. Elias and his father, being lifelong friends of the family, came to their rescue. It cost the pride of her father who tried not to feel beholden to his oldest friend. Just when things were straightening out, Helena's father was arrested and thrown into Newgate prison for a crime he did not commit. Unfortunately, this caused a rift between their fathers. Helena's father forbade his family to have anything to do with Elias and his father. It caused anguish and pain between Helena and Elias as they cared for each other. The story covers the disgrace and shame that followed Helena and her family. Elias and his father believed in Helena's father innocence. Elias would not rest until he had done everything to clear their name. Helena went through h*ll as her own cousin had no concern for her and disparaged her and her family to one and all. I liked Helena's character. She has a good head on her shoulder, she is modest and humble, outgoing and adores the outdoors. She is someone her family can depend on. Although the strain is felt keenly by her. Elias is a quiet unassuming young man. He too is kind, thoughtful and humble. Together, Helena and Elias are a good match. Their day may never come as Helena feels her family's disgrace will keep Elias from ever pursuing her. Elias fears the day may never come when Helena would accept his suit. Such a conundrum. I found that when the characters were happy, I was happy. When they were shocked so was I. When things were desperate, I felt it. When all hope looked lost, my heart went out to them. This is truly a wonderful book of trust and enduring love and friendship. A must read. I highly recommend it. 4.0 out of 5 starsIs loyalty to be believed? Capturing the Viscount's Heart by Abby Ayles is an endearing story from true love from childhood on. Although it is unlikely that a Earl and a tradesman, however prosperous, would remain lifelong friends, let alone consider marriage between their offspring, that is the crux of this story. When Helena Leeson is 14, her childhood affection for her friend, Elias, begins to turn into a more mature love. He leaves for school and is gone for four years. She spends those four years maturing and learning and when he returns home, he is astounded to find his childhood friend has become a beautiful woman. Helena's father is the proprietor of a jewelry house but always looking to better himself he invests a great deal of money in an Italian banking enterprise, also acting as their agent in acquiring other investors. Without warning the investment turns sour and a great many people have lost a good deal of money. This, of course, includes Helena's father. Her father's friend, the Earl of Wismoth and his son Elias are there to help their friend in their time of need, including investing in and saving the business, leaving their friend at its helm. All is going well until Mr. Leeson is abruptly arrested for embezzlement and thrown into Newgate. Elias and his father, the Earl, are in Italy so they don't arrive home immediately. When they do they plunge headlong into investigating, knowing that Leeson is innocent. Leeson is so angry and miserable in prison that he forbids any interaction between the two families. Can this situation be resolved? 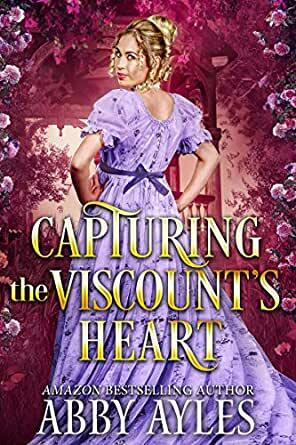 Capturing the Viscount's Heart is intricately plotted an interesting to read. There are many characters and settings to the story and some people behave oddly, but that is what makes the story, isn't it? Helena is a proper Regency heroine, able to think for herself but remain true to those around her. Elias is a gentleman, careful of the feelings of others and polite at all costs. They manage to work toward a solution, with some detours, and mostly individually, trying to obey Leeson's edict. Helena's mother spends a great deal of time ill in bed, which is mostly how Regency mothers deal with adversity. The word stress is used often in this story, which is not appropriate, as it was not used at the time. But all in all Capturing the Viscount's Heart is an intriguing and well-written book with good characters and a relatively realistic plot. I recommend it. I received a free ARC of this book in exchange for a fair and honest review.